(TibetanReview.net, Nov29, 2018) – Chinese engineers and labourers are braving the cold and racing against time to expedite the completion of the Sichuan-Tibet Railway, reported atimes.com Nov 27. Dubbed by Beijing as the most challenging railway project in the world, President Xi Jinping had on Oct 10 called for its speedy completion. 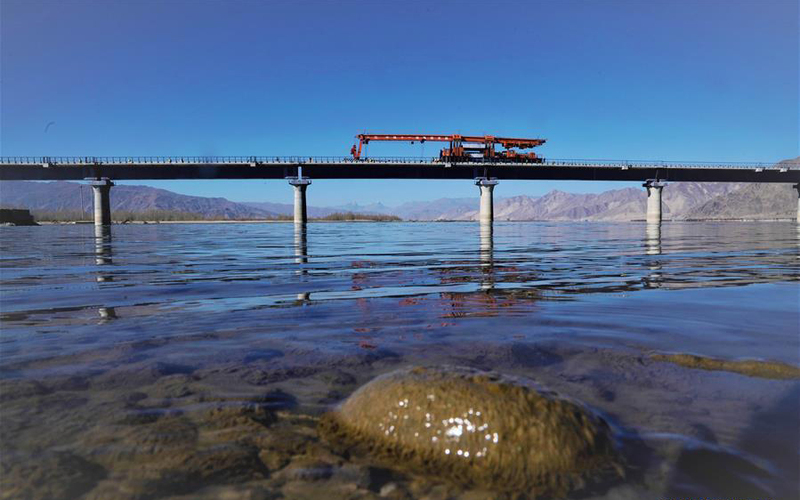 China’s official Xinhua news agency reported Nov 27 that the laying of track for the first cross-river bridge on the 403-km Lhasa-Nyingchi section of the Sichuan-Tibet Railway had started on Nov 26. This is located in Gonggar County of Shannan (Tibetan: Lhokha) City. Workers and engineers with the state-owned China Railway Construction Corp are braving the cold and racing against time to finish all the work on the section before the snow and the Himalayan cold currents make their job impossible, said the atimes.com report. The report noted that the new rail artery on top of the existing Qinghai-Tibet Railway will link Lhasa to Chengdu, the capital of Sichuan province some three kilometres lower in altitude in a basin east of the Tibetan Plateau. The report said Beijing had earmarked the new project – as well as future lines to connect Lhasa with Kunming and Ürümqi, the capitals of Yunnan province and the Xinjiang Uygur Autonomous Region respectively – in a bid to open up an economic backwater and cement its control of the region with better connectivity. It said the fully electrified heavy rail link will have to cut through swamps, rugged gorges and mountains that lie between the two cities, with an elevation difference of more than 3,000 metres. Construction of the 105 billion yuan (US$15.2 billion), 1,629-km new railway line started from both ends in 2014. Once completed, trains will streak from the Sichuan Basin to the Roof of the World at 160 km/h by 2025.